The cata-fisheye camera is a panoramic imaging system which uses a curved mirror as a simple optical attachment to a fisheye lens. The cata-fisheye camera has a simple, compact and inexpensive design, and at the same time yields high optical performance. It is most suitable for capturing panoramic images with a reasonable vertical field of view that has more or less equal coverage above and beneath the horizon - ideal for applications like perimeter surveillance, video conferencing and navigation. The camera captures the desired panoramic field of view in two parts -- the upper part is obtained directly by the fisheye lens, and the lower part after reflection by the curved mirror. These two parts of the field of view have a small overlap that is used to stitch them into a single seamless panorama. The cata-fisheye concept allows the design of cameras with a wide range of fields of view by simply varying the parameters and position of the curved mirror. 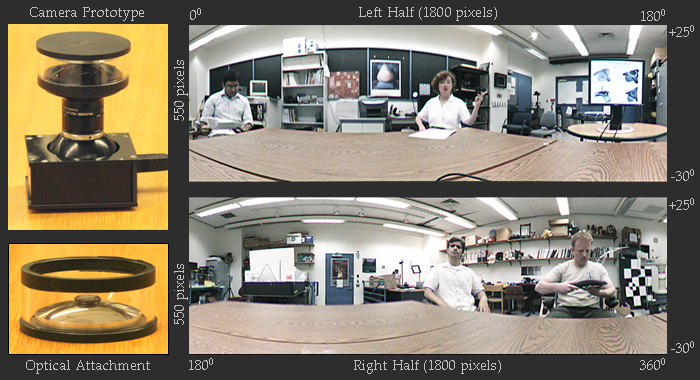 We provide a framework for designing cata-fisheye cameras where, for a given required panoramic field of view, the framework computes the optimal mirror parameters. We also provide a simple automatic method for the one-time calibration needed to stitch the two parts of the panoramic field of view. Finally, we have evaluated our design with respect to the optical quality of the captured images, the working range of the camera over which the parallax is negligible, and the spatial resolution of the computed panorama. 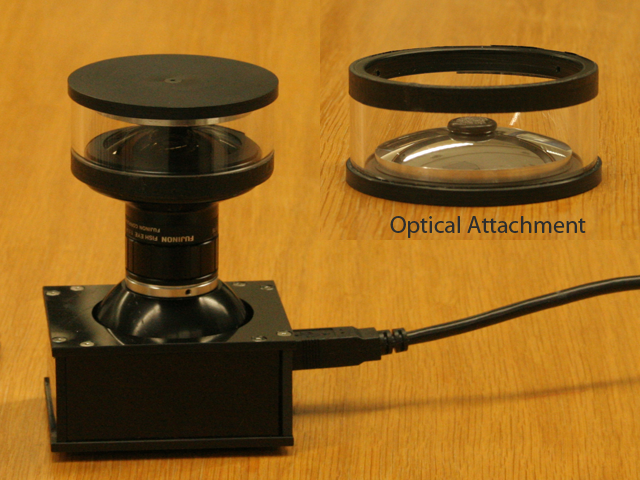 Our prototype cata-fisheye video camera is designed using a spherical mirror and can capture high resolution panoramic images (3600x550 pixels) with a 360 degree (horizontal) x 55 degree (vertical) field of view. "Cata-Fisheye Camera for Panoramic Imaging,"
The upper part of the panoramic field of view is obtained directly by the fisheye lens and the lower part is obtained after reflection by the curved mirror. These two parts of the field of view have a small overlap that is used to stitch them into a single seamless panorama. The prototype cata-fisheye video camera is designed with a spherical mirror and can capture high resolution panoramic images (3600x550 pixels) with a 360 degree (horizontal) x 55 degree (vertical) field of view. Here is a panorama captured in a typical video conference scenario. In this case, the participants are sitting at a distance of about 5ft from the camera. This panorama was captured on a busy street. Note that objects can be recognized even at large distances, due to the judicious use of our available pixels.